JYJ’s Kim Junsu has become a hot topic for showcasing his explosive vocal talents at a wedding ceremony. A video was recently uploaded on YouTube with the title ‘Even Wedding Songs Can Become a Work of Art with Junsu’. 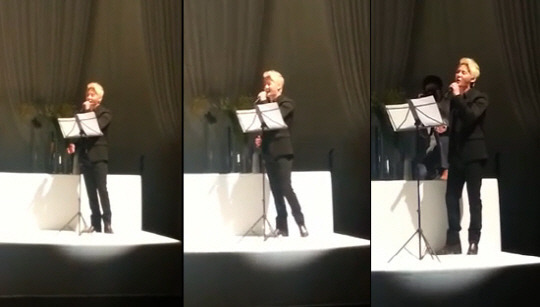 The video shows Kim Junsu singing his own interpretation of H.O.T’s ‘Blessing’ at his cousin’s wedding, giving his all for his relative’s celebrations. With blond hair and a clean-cut black suit on, Kim Junsu drew attention for his wedding guest attire as well. His proportional body and small head had him landed in the ‘Problematic Guests (for drawing too much attention)’ list. He stole the eyes and ears of everyone at the wedding with his high notes and clear voice. He looked at his cousin with tear filled eyes and conveyed as many emotions as he could in his voice, giving everyone at the ceremony goosebumps.